Look at this sweet pink tea cup! This fun idea can be apply at any garden style. In addition, the tea cup looks great with small white circle. Choose any flowers to plant and see how pretty your garden will be. This artificial tire planter can be the most interesting figure of your garden. Paint the tire planter as like as the brick wall. Three vertically organized tire planters are enough to make this wonderful landscape. Don’t forget to cover the flowers from direct sunlight. DIY hang tire planters can be made immediately within less than an hour. You only have to put some soils and plant the flower you like. However, pay attention to the hook that will be used for hanging the tire. It should be strong. Paint six tires with orange color and one tire again in white. Arrange the six orange tires in around shape and put the white one on the top of it. Plant the flowers at each of them as your desire. Then, don’t forget to give water periodically. This excellent tire planter design looks great for your garden. Add a touch of creativity to create this amazing fish. In addition, paint it at silver color to make it looks modern. Your children will be amazed seeing this tire design. Tire planter hanging from the tree will dramatically attract you eyes with white paint. It seems eye-grabbing by violet flowers on it. Moreover, there are some chairs in white that in one harmony to create simple and cozy garden look. DIY combo looks wonderful for your porch. You can plant some varieties of flowers on it. It doesn’t matter whether pink, red, yellow, violet, and many more. Even, you can bring this DIY Combo tire planters at your backyard. Paint the tire in white to use it as space divider. Take a look at the picture of border line above that uses tire planters with flowers. Therefore, those tire planters are amazingly become the line to separate between grass and pebbles area. There is a big Minion at the garden that watches you along day and night. 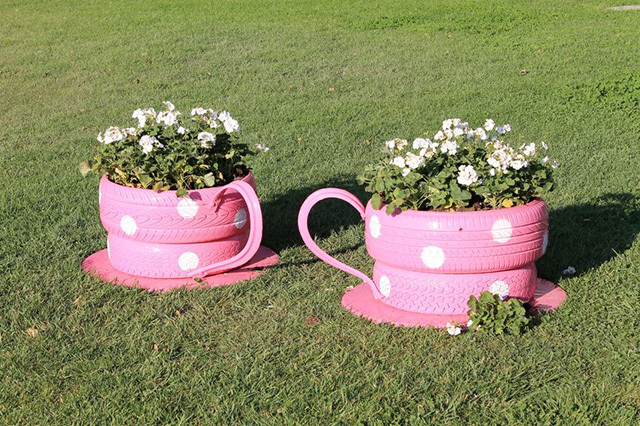 This tire planter idea is unexpected. With one-eye planter, the garden looks more friendly and cute. Furthermore, the green grass seems comfort to grow up there.